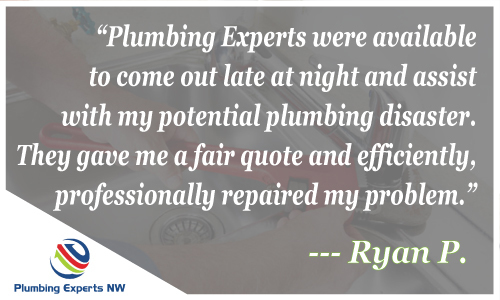 We don't just handle your plumbing issues, we aim to make big fans of our style of honest plumbing service. Remember: Your ultimate satisfaction is always GUARANTEED! 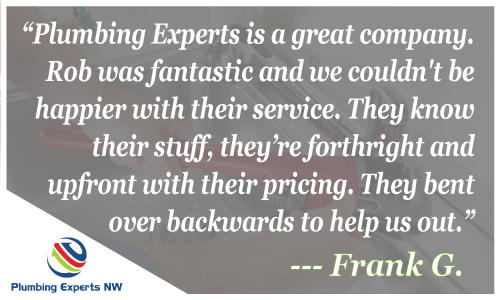 Complete Review: "Plumbing Experts is a great company. Rob was fantastic and we couldn't be happier with their service. They know their stuff, their forthright and upfront with their pricing in the bent over backward to help us out." 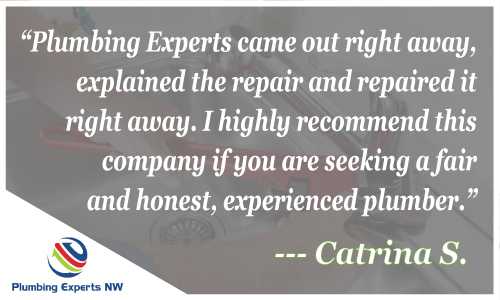 Complete Review: "I called Plumbing Experts in Everett when I discovered we had a leak. Robert came out right away. I was pleased with his professionalism and he explained in great detail the repair and repaired it right away. He came out an additional day to make sure everything was fine with his work. I highly recommend this company if you are seeking a fair and honest experienced plumber. Being in the Real Estate industry I run across many Plumbers who are so-so but Robert was exceptional." Complete Review: "I had a late Friday emergency that involved an outside spigot that would not turn off. I called and emailed every plumbing company around me with no luck. Only Robert and his team at Plumbing Experts were available to come out late at night and assist with my potential plumbing disaster. Robert arrived on time and took a quick assessment of my situation, gave me a fair quote (that did NOT increase) and efficiently and professionally repaired my problem. As a new owner of a home, I cannot tell you how pleased with the service I received. I hope to not have any further emergencies but if I do I will for sure call Robert. I would highly recommend!!!"